Black sacrifices a stone at here to take up a strong position towards the right with the hanging connection of - - . 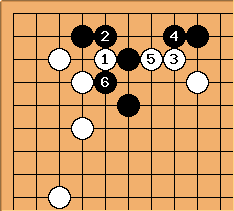 The final move has been played elsewhere too, to cover the cutting point in a looser way. Of 24 games starting with , 3 end in this position. Tenuki has been found at , , and . 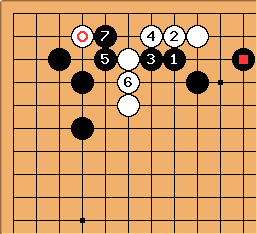 In an interesting variant, Black offers to sacrifices at the other side. White can accept the offer, as here, or decline it and live inside with at . These are single instances of such pro games. 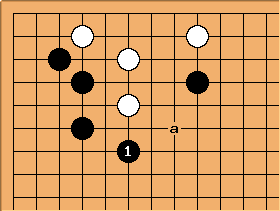 To play this line black need some backup around or else white may chose to play 4 instead of 5 and cut if black blocks. Fare more often than the small scale follow-up, Black will further pressure White on a larger scale with the capping play of . However, since White is both low and light, she doesn't need to react and will probably deal with the whole board implications of . Her response is not urgent. 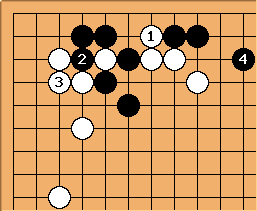 If she moves out, a has been seen in pro play, a case of your opponent's good move is your good move. 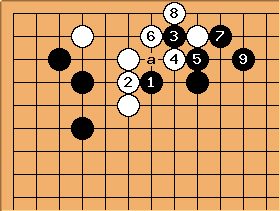 Amateurs will often play the crude move of , leading to bad shape. 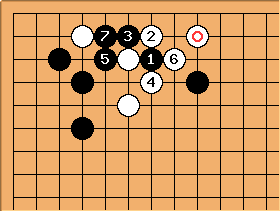 However, Cho Hun-hyeon tried this in 1996 too, against Seo Mu-sang (colours reversed). The stone was present. This went to the / exchange and White gave up . Black then pulled out the cutting stones, but in very poor shape. Obviously White needs to come back at a. In fact Cho won this game, despite some serious dangosity. 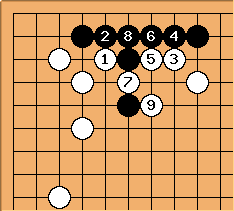 Similar crude diagonal moves of and here, if answered submissively, can trick Black into this painfully low position. It is not clear who's being attacked now. 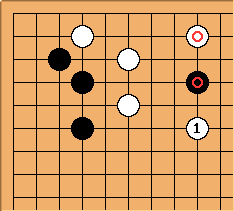 is probably the reason why Cho could afford the "crude variation" above with a white supporting stone there instead. This is an astute move to grab the corner, if Black becomes interested in those points. becomes rather redundant with the ponnuki. The natural thing to do here is attack Black's open skirt. 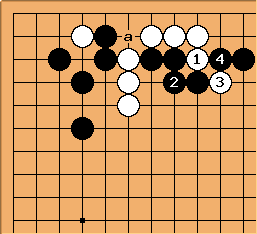 Black's natural response is , moving out. He could also attach to the strong stone in order to leverage some power against . 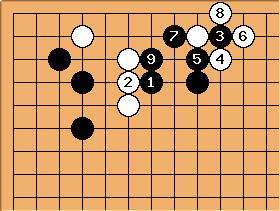 Far less natural is for White to attack with here. This stone is already light due to the presence of . Such an attack will usually only be carried out in a much later stage of the game. 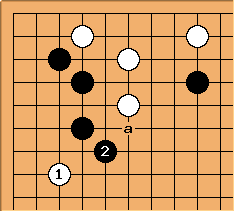 WME notes: I removed all diagrams that were not quite follow-ups of the catenaccio joseki but rather variations of it and move these back into the said joseki. I removed redundancy and tagged comments. Last but not least, I added my gobased analysis of pro games.